That is the vision of Wellspring Canada, a non-profit charitable organization whose focus is to alleviate the pain of cancer that people (and if need be, their families) suffer from, in its many forms, as much as possible. Their goal at the Triple Gym in Mount Royal University’s recreation centre was no different, when the Cougars Volleyball team faced Thompson River University in a special match on Jan. 9th to show their support for those suffering from cancer. 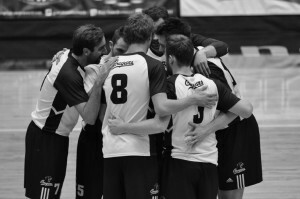 The Cougars men’s team faced a close back and forth showing off fierce court presence, and dominated Thompson River University’s Wolf Pack winning in all sets, while the women’s teams on both sides concluded with a split set. The Wellspring event that took place along the game, “Toupee for a Day” was marked with both players and game attendees wearing bright, rainbow-colored toupees to show support for cancer patients, and even participating in a raffle to gather money to support Wellspring and the services it provides. Wellspring Calgary was co-founded by John Stephure, Rita Egizii, and Barbara Cunnings-Versaevel and began operation in 2007, and since then, almost all of those who either worked or volunteered for Wellspring have, much like the founders, been personally affected by the loss or pain that cancer has brought, like in the case of Holly Logan. Holly Logan, 23, a Wellspring volunteer who helped set up Wellspring’s fundraising at the Triple Gym, has had family suffer from cancer. “I think a lot of people don’t recognize how long lasting the impact of cancer can be; its impact on people’s emotions and relationships is heavy,” Logan said when asked why she volunteers for Wellspring. Wellspring’s vision, that no one has to face cancer alone, is one that brings people together to fix the separation caused by the declining state one goes through as a victim, or the family of one; the night of Jan. 9 was no different.